A meeting between the European Rugby Cup (ERC) and the RFU and Premiership Rugby in Dublin ended without any resolution to the dispute over the future of the European club rugby, although an ERC statement said talks had been "productive". A further meeting is set to take place in Rome on October 8. ERC is in dispute with Premiership Rugby over the £152 million deal struck last week with BT Vision which, along with four-year rights to the Aviva Premiership, sold European rights to the fledgling broadcaster for three years from 2014-15. This clashes directly with the existing ERC deal with Sky Sports to exclusively broadcast European club games through to 2018. ERC claims it has the rights to sell matches in the Heineken Cup involving English clubs and accuses Premiership Rugby, which represents the 12 Aviva Premiership clubs, of entering into an agreement despite not having the rights to do so. Premiership Rugby counters that it can make its own deals from 2014-15. After the five-hour meeting in Dublin broke up, ERC issued a statement which said there were "productive discussions regarding the future of the club game in Europe with a general resolve among all stakeholders to reach agreement towards a new accord." The present accord expires at the end of the 2013-14 season. 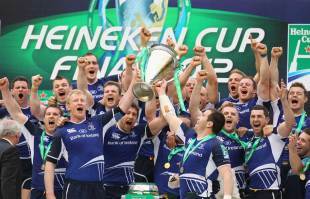 In June, England and France gave two years' notice of their wish to exit the present format of the Heineken Cup. However, the French clubs have made clear they do not want to limit themselves to an Anglo-French tournament if others refuse to follow. Chairmen of the 12 Aviva Premiership clubs, who at the moment appear to be out on a limb after unilaterally agreeing the deal with BT, are likely to meet again this week to discuss the approach they will take in Rome.